A dental implant is an artificial tooth root the dentist places into your jaw to support a crown, bridge or a fixed denture. Dental implants are a good alternative to replace missing teeth due to gum disease, decay, periodontitis or injury. Let’s start from the basic. There are three different parts in a single implant. The screw or fixture that goes into your jaw. The crown that replaces the missing tooth. The third part is the abutment that connects the implant to the crown. The implant fixture is first placed in the jawbone and leaved there for 3 or 6 months to integrate to the bone. Once the implant is stable in your mouth, the dentist attaches it to a bridge, a single crown or a denture. In some cases the patient doesn’t have to wait for the integration period. The dentist can complete the job within the same day (same day implants). This is a hot topic on forum and chat. So I will try to explain all them as simple as possible. 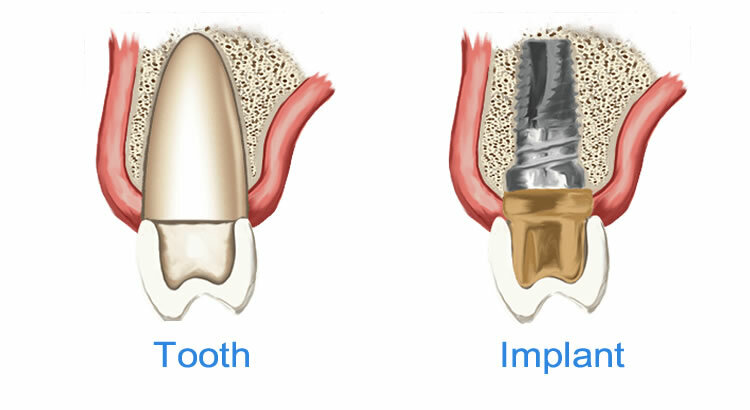 There are two main implant procedures to choose from: “two-stage” or “one-stage”. In case of “two-stage” process, everything is done in two or a few more appointments. In the first stage the dentist places the fixtures in you bone. Screws remain covered by the gum while the bone grows around them. This protects each implant from chewing forces. Once the fixtures are stable enough, the second stage begins. The dentist uncovers the implants and fixes the abutments on top of them. In the final step you get your replaced tooth, bridge or fixed denture in your mouth. Why does the dentist go with “two-stage” dental implants procedure ? The answer is simple. The two-stage procedure is required if you do not have enough bone in your jaw to hold implants immediately. The complete healing period is about 6 months. Even less. Alternatively there is the “one-stage” procedure. Everything in one appointment. If you have enough bone and it is in good condition, there is no need to wait for the healing time. You can leave the dental office with your new teeth in the mouth. “Same day implants” or “teeth in a day” is how commonly people call the one-stage technic. Both single stage and two-stage implants procedures have similar success rates. Your dentist knows which procedure is the best for you. Often I can read questions like: what is the best implant technique ? Let’s say that the best dental Implants procedure doesn’t exist. It depends on the real case to solve. Dentists have a few ways to choose from to replace your lost teeth with implants. Ok, let’s take a look at what may happen in your mouth. This is not a detailed description. It is just to give you an idea. All-on-four: 4 implants and 1 fixed denture: in this case everything will be done in one day (same day teeth). The dentist will insert 4 implants in your jaw and then a fixed denture will anchored to them. The same day implants is doable if the primary stability of the fixtures allows you to chew correctly. The dentist uses a tailored surgical guide to insert the implants in your bone. It is a risk-proof technic since 1999. The computer helps the dentist to set the exact location for each implant. The therapy is more accurate and less invasive than in traditional cases. Recovery and healing time are shorter. Flapless dental implant: placement without to cut the gum. A dental implant is inserted through the mucosal tissues without creating a flap with bistoury. In this case there is no need for cutting your gums. The healing time will be very fast. Senior patients will be very happy with the flapless technic. Before to initiate any procedure, it is very important you do a few exams. Don’t worry, they are not painful ! 3D DENTALSCAN: ensures the dentist you have the enough jawbone thickness to hold the titanium implants. It is the starting point of the computer guided surgery. Dental X-Rays: It is the most used exam in dentistry. It is possible to get the situation of your mouth, bone, teeth in one shot only. Standard X-Rays are not so precise. It is hard to relay on them to plan the treatment. Dental impression: with the help of dental impression, the technician can prepare a model of your jawbone and teeth, if any. The plaster cast is the base to create your new dental prosthesis. Dental implants before and after photos: Pictures are very helpful to get a clear idea about the starting point and the final result. Do I feel pain getting dental implants ? Getting dental implants doesn’t hurt at all. You will experience no pain. The insertion of each implant will be done under local anesthesia. In case of a full mouth makeover, the deep sedation is preferred. General anesthesia is very rare and very expensive too. After surgery you may feel some discomfort but it is not the same for all people. Over the counter painkillers are more than enough to dull the pain. Your dentist may prescribe you ibuprofen (Advil) or acetaminophen (Tylenol). If you want to replace one missing tooth a single dental implant and a crown solve your problem. This treatment do not affect the health of the other teeth. This is a very aesthetic solution to replace front teeth, incisors and canines. In this case, an implant should work better than a dental bridge on natural teeth. This is the case you have lost two or three teeth. Usually they are molars and premolars. The dentist can propose you a bridge on implants. The bridge is made of crowns attached together. The prosthesis relays on two or more dental implants. The screws in the bone have a big responsibility. They avoid your bone to reabsorb. It is not possible for you to remove the fixed bridge by yourself. You can always ask your dentist to do it. In case you lost all your natural teeth, you have hard life. The denture is not stable in the mouth. The dentist can help denture wearers with a fixed denture supported by implants. Usually the fixed denture have 12 crowns: 4 incisors, 2 canines, 4 premolars and 2 molars. This solution needs 4 or 6 dental implants to stay in place. It is easy now to guess the technics names: all on four and all on six. Replacing all teeth is equal to say: “Full mouth makeover”. The most known fixed full denture is: “Toronto bridge”. I know there are so many difficult words. I will try to keep them easy. Are there additional options ? Yes, of course. The denture pink part is there to hide the lost bone tissue and gum. In case of normal bone quantity and quality, false gingiva is not needed. You can go with a full arch of teeth supported by 6, 8 or 10 dental implants, that is the most aesthetic solution. Your natural gum will surround your new prosthetic teeth again. There is no need for the plastic gingiva. The full arch is the best solution for young people without teeth. If you are looking for a “Hollywood smile”, the full arch of teeth on implants is your solution. After some time that differs from patient to patient, dentures become loose. people start to use a lot of dentire adhesive but even in this way the dental prosthesis doesn’t fit the gums as the first days after dentures delivery. Mini dental implants are the ultimate solution to stabilize the dentures both lower and upper. The dentist places 2 mini implants in the lower jaw and, at least, 4 in the upper one. In this way the denture can not move because is kept in place by the mini implants. Searching in Internet you may often read the question: “Which is the best brand of dental implants ?”. There are hundreds of dental implant brands and companies, and all have their pros and cons. Just to list some of them: Nobel Biocare, Strauman, Zimmer, BioHorizons, Astra etc. The point is that each of them have to satisfy the basic manufacturing rules, in order to get the license to be sold (FDA in US: Food and Drug Administration requirements for dental implants). The main factors for implant success are: the surgical skills of the surgeon and the prosthetic skills of the dentist who places the implant supported prosthesis. If you choose an inexperienced dentist the risk of implant failure increase. The big differences in dental implants cost depend on the money a company spend for research and marketing. What materials are implants made of ? Generally implants are made of titanium. Why this material ? It has unique features such as strength, lightness and durability. In addition titanium screws are extremely bio-compatible that avoid to cause you allergy or rejection crisis. CP4 is the most commonly used titanium even if there are alternatives. Modern implants also have rough surface. It improves the osseointegration time and the overall success. Several different types of implants are available as well as procedures. The choice depends on the quantity of your bone and your general health. Even the restoration preference and the price you can pay for make the difference. There are a few alternatives to titanium such as ceramic or zirconia implants. Their cost is still high because they are not widely produced yet. May my implants fail ? What about success rate ? The dental implants success rate is very high: more than 95%. Success or failure of implants depends on different causes. Most of all on your overall health. If you take drugs which affect the health of your mouth the chances of osseointegration decrease. Your dentist has to put the right number of implants in the right positions. In this case chewing forces are well distributed avoiding the implants to fail. We know that gingiva and bone reabsorb after tooth extraction. If that happens sinus lifts or bone grafts are necessary to add bone tissue to support the screws. Are there additional failure causes ? Yes, for example: pregnancy, HIV and poor oral hygiene. It is not all. You know that smokers and diabetics are all at high risk ? Many dentist refuse to treat people who do not want to quit to smoke. Gum diseases may also be against implant treatments. I’m going to name the most dangerous. Peri-implantitis is a bacteria infection that affects the bony tissue around the implant. It increases the chance of long-term failures. People that use steroid or suffer because of osteoporosis are at risk of early implant failure. What about additional costs ? The price I wrote are for one implant only and do not include treatments like bone grafting or tooth extraction. So it is easy to calculate the price for an implant with its crown. You may pay from $1200 up to $4350. I know that if you compare the dental implants cost to the price for alternatives, implants may result the most expensive. There is one thing to keep in mind. They last longer that’s why, at the end, they are cheaper. They also avoid you to lose your bone. Even all your natural teeth and your overall mouth health take advantage from implant dentistry. After initial examination and X-Rays, your implant expert provides you with a treatment plan. Each plan includes the number of appointments, number and type of implants, the overall time to get the end result and costs. In case of changes along the way, the dentist has to tell you in advance. Just to avoid cost surprise. Many implantologists give the patient more than one treatment plan and different costs. At least: the most affordable and the most expensive. With different plans in the hands, you can choose the best for your pocket too. Does insurance cover the dental implant cost ? In general, dental insurances do not cover the cost of dental implants. There are different reasons why they do not do that. Some of them see implants as cosmetic procedures. To get a contribute, you should check your health insurance. The reason is that health insurance may cover part of the treatment plan because of the reason for your tooth loss (i.e. injury). Before to proceed with any treatment, you should ask your insurance provider all questions about dental implants cost coverage. Where to get affordable implants ? Dental implant costs are very high and low-income people as well as retired seniors cannot afford those price. Here are some tips to find places where to get some discounts. First, dentists may offer you a discount for prepayment in full. Other doctors offer their patients without insurance no-interest or low-interest payment plans. Lastly, dental school clinics offer reduced rates for dental services provided by supervised students. If you are asking whether dental implants are the only way to replace missing teeth or not, my answer is no. Dentists have a wide range of implant alternatives. I will list a few of them. Bridge on your natural teeth: The bridge is supported by the close teeth. Your doctor has to reduce the natural teeth size and then to place the bridge on them. It is a real pity to touch healthy teeth. Partial dentures attached to natural dental elements: useful if you want to replace some missing teeth, but can’t afford dental implants or fixed bridge. Partial denture can be a good implants alternative. Flexible dentures: They provide several advantages. They can look natural, stay securely in place and be more comfortable to wear. Standard full dentures: this is the most used teeth replacing method in the world. It doesn’t mean that it is the best. There are a lot of disadvantages. First of all they cannot stay fixed in your mouth as they do with implants. Dentures wearers are not so happy as you may think. I have to let you know that implants alternatives have some downsides. Discomfort when you eat or talk and poor aesthetic look are the most common. Take care of your investment !!! I agree with you, implants are titanium made, they can’t get cavities. Porcelain or zirconia crowns do not decay like a natural tooth. Everything said is true but it doesn’t mean you can avoid oral hygiene and dental care (checkup, cleanings and hone oral care). There are easy rules that can help you to keep your new teeth longer. I will list some advices to make your implants to do not get damaged. Brush and floss as you do or did with your natural teeth. Do not forget to take care for your gums. They support your new teeth. The tissue around the implant must always be pink and healthy. Oral hygiene keeps your dental implants for years (even lifetime). If you don’t remove plaque from your mouth you get implant disease. The most dangerous is peri-implantitis. I also recommend you regular cleanings at the dentist and dental check-ups. They are very important for implants durability. I agree that it’s been known that dental implants are used to permanently replace missing teeth. I like how you discussed every single information about dental implants-it’s process, importance, and functions. My sister is planning to do this procedure as she lost 4 teeth during an accident. I think it’s a great idea. So far dental implants are the best way to replace missing teeth especially for young people. It can be a costly procedure but comfort and aesthetic are incomparable. We wish your sister all the best !